The Paramedic Program requires that each student complete, or have previously completed, college level Anatomy & Physiology I & II courses. Please NOTE: The fees associated with completing the A&P requirement are not included in the Paramedic Program tuition! Each new print copy of Anatomy & Physiology also includes Navigate 2 Advantage Access that unlocks a complete eBook, Study Center, homework and Assessment Center, and a dashboard that reports actionable data. World-Class Medical Content To properly assess and manage a patient, a prehospital provider must have a solid foundation in human anatomy and physiology. 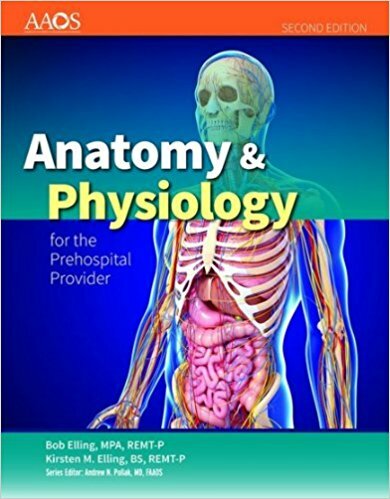 Anatomy & Physiology for the Prehospital Provider, Second Edition, uses a systemic approach to building this foundation. It begins by providing an overview of the basic systems of the human body and then explores each system in detail chapter by chapter, delivering a thorough discussion on the system's anatomy, physiology, and pathophysiology. With clear, accessible language and informative illustrations, the Anatomy & Physiology for the Prehospital Provider, Second Edition is an effective and engaging learning experience. Strong Application to Real-World EMS Progressive patient case studies evolve throughout every chapter, offering the learner genuine context for the application of the knowledge presented. This approach shows the learner how all of the information will be used to help patients in the field. The Second Edition content includes: New section on the basics of chemistry Expanded section on joints Expanded content on muscular physiology Updated illustrations Additional pathophysiology, including cellular injury. Navigate 2 Advantage Access for Anatomy & Physiology for the Prehospital Provider, Enhanced Second Edition is a digital-only Access Code that unlocks a comprehensive and interactive eBook, student practice activities and assessments, a full suite of instructor resources, and learning analytic reporting tools.